From looking at old property maps, I can see that there was a little subdivision at the northwest corner of the western bend of the river. 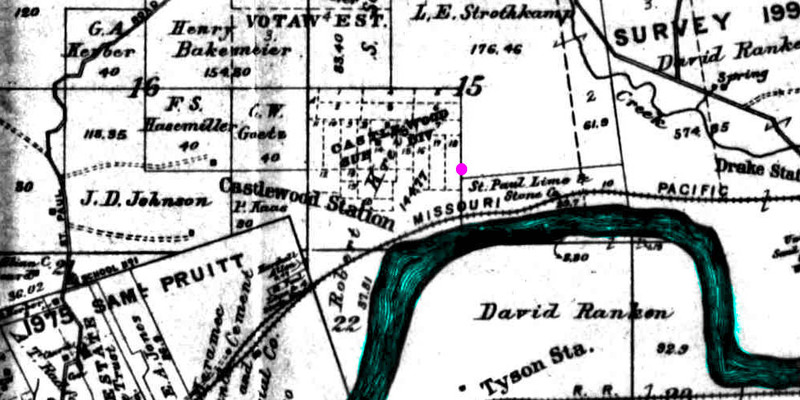 In the 1909 map above, you can see Castlewood Sub Div on land owned by Robert Kre?st. On a 1878 map, the area is also parceled out and labeled St Louis Park. 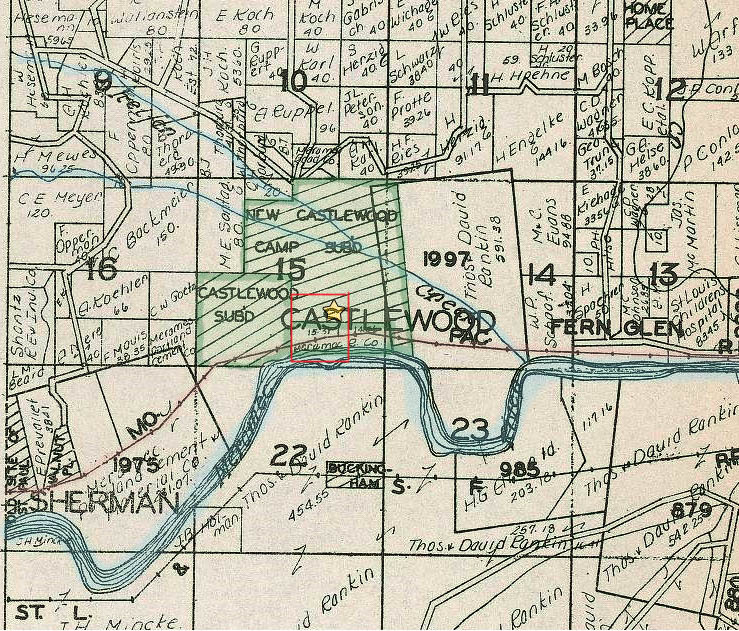 It occupied the lower right corner of the Castlewood Subdivision illustrated in the 1930 map below. In 1915, the Meramec Realty Company developed the original Castlewood recreational area with 250 clubhouses, hotels, boathouses and bathhouses. On the 1930 plat map below, you can see this tract on the river's edge. It was on the railroad line, so people could flock out there by train for weekends. At some point Lincoln Beach was established on the south bank of the river and a ferry took people across from the train and clubhouse area. Looks like the riverside tract was developed first, then the expanded Castlewood Subdivision, and finally the New Castlewood Camp Subdivision. The north shore of the river is lined with towering limestone bluffs so Castlewood had to be better known for its seclusion (and shady oak woods) than for its sunny river access. Meramec River amusements near the Highlands: St. Louis' playground, 1890 TO 1940 This area, now Greentree Park, is located in Kirkwood, just to the west of I-270. Legends of America. Historic playgrounds along the Meramec River.